RAPID CITY, SD – Rank broncs go nose to nose with cowboys at the PRCA Xtreme Bronc Match and Saddle Bronc Futurity coming to Rapid City, SD, Wednesday Jan. 30, 2019. In one of the PRCA’s newest events, the event showcases saddle bronc riders and horses beginning with a Saddle Bronc Futurity at 10:00am in the Barnett Arena at the Rushmore Plaza Civic Center. Top Stock Contractors compete with two-horse teams made up of the future super-star colts of rodeo; five years in age or younger. Riders also are being scored with the top three cowboys from the Futurity earning a spot in the Xtreme Bronc Match held that evening at 7:30p.m. The PRCA Xtreme Bronc Match features 30 PRCA Bronc Riders against 30 of the top PRCA Bronc Horses with a three-man, sudden death short round to determine the Champion. 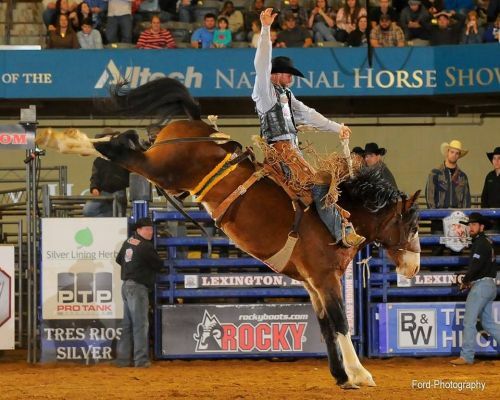 Riders will be competing for a $10,000 cash purse, prize money won counting toward the 2019 World Standings and a trip to the Wrangler National Finals Rodeo. The Xtreme Bronc Match is loaded with talent leed by four PRCA World Champions in Taos Muncy, Corona, NM, Zeke Thurston, Big Valley, Alberta, Wade Sundell, Coleman, OK, and Rusty Wright, Milford, UT; two WNFR Average Champions CoBurn Bradshaw, Beaver, UT, and J.J. Elshere, Hereford, SD. Rodeo personnel will include 5X PRCA Announcer of the Year, Wayne Brooks and 7X Clown of the Year and 2X Coors Man in the Can, PRCA Barrelman, Justin Rumford. Also in the arena will be a special guest appearance by the Young Living Percheron Hitch. A package buy is an option for this event whereby the purchase of either a ticket to the PRCA Xtreme Bronc Match or the Girls in Spurs Ladies Night held on the same day (Wed., January 30, 2019) earns the purchaser free admission to one or the other events. Tickets are available at www.gotmine.com; 1-800-GOT-MINE and a the Rushmore Plaza Civic Center Box Office, Rapid City, SD.